THERE ARE CURRENTLY EIGHT QUORUMS of the Seventy. Each quorum may have up to 70 members. http://www.lds.org/church/leaders/quorums-of-the-seventy?lang=engJanuary 23, 2017. About Me. I’m back in Brooklyn. I’m at Starbucks, near where I live (because I am blacklisted; I cannot connect to the internet in my room at YWCA Brooklyn since the day I wrote that CIA Mormon Robert Gates, former Secretary of Defense, is a “911” insider, and, a Hudson River atomic bomb insider). I rented an Enterprise car in Middletown, I stayed overnight Saturday and Sunday at Harvest Inn in Pine Bush, I attended three meetings of Jehovah’s Witnesses in Montgomery, and I returned the Enterprise rental car I rented in Middletown.I ate meals (what little I could- no teeth in my upper gums) at Cup and [Flying] Saucer Diner across the road from Harvest Inn Motel. This morning one of the waitresses kindly programmed my phone for GPS directions, to Enterprise Car Rental, and, wrote down the directions on a piece of paper, and I still got lost!I telephoned Enterprise two or three times within 15 minutes after I rented the car (unfamiliar with car, Honda Accord), and three or four times within 15 to 30 minutes on my way to return the car, I told Matt, Enterprise employee, he could charge me extra for so many roadside assistance telephone calls. For the small community in Morgan County, see Enterprise, Morgan County, Utah. Enterprise is a city in Washington County, Utah, United States. The population was 1,711 at the 2010 census. Enterprise is home to two schools, Enterprise Elementary School (K-6) and Enterprise High School (7-12). Nor’wester has been used to describe several different types of wind. Nor’wester (New Zealand), a New Zealand wind pattern resulting in the “Nor’west arch” and leading to hot, dry weather on the east coast of the South Island. Nor’wester (Bangladesh), a stormy weather pattern in Bangladesh (and adjacent portions of India) occurring in the spring. Some of these storms may be progressive derechos. Nor’wester (novel) a novel by Clements Ripley which served as the basis for the 1959 film John Paul Jones. QUESTION: Exactly how many trees will fall during the “nor-easter” today, January 23, 2017?? ANSWER: Only Thor and the rest of the “super technology” “masters of the universe” can answer that question. 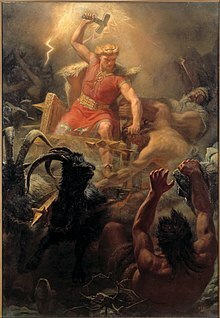 In Norse mythology, Thor (/θɔːr/; from Old Norse Þórr) is a hammer-wielding god associated with thunder, lightning, storms, oak trees, strength, the protection of mankind, and also hallowing and fertility. 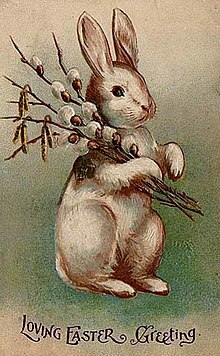 The cognate deity in wider Germanic mythology and paganism was known in Old English as Þunor and in Old High German as Donar (runic þonarᚦᛟᚾᚨᚱ), stemming from a Common Germanic *Þunraz (meaning “thunder”). “Nor’easter” is the third episode of the second season of the anthology television series American Horror Story, which premiered on October 31, 2012 on the cable network FX. The episode is written by Jennifer Salt and directed by Michael Uppendahl. Nor’easter was nominated for a Primetime Emmy Award for Outstanding Single-Camera Picture Editing for a Miniseries or a Movie. The episode focuses on the asylum’s staff attempt to maintain order as a fierce storm hits the area, allowing some patients to try another escape. Chloë Sevigny guest stars as Shelley. The episode originally aired two days after Hurricane Sandy‘s U.S. landfall. This episode is rated TV-MA (LSV). 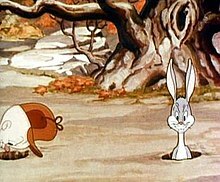 Bugs’ first appearance in A Wild Hare (1940).